CoinFi Crypto Research - Cryptocurrency Trading Signals - Episode 003: Is Ethereum Overvalued? All Categories ​>​ Crypto Trading Podcast ​>​ Episode 003: Is Ethereum Overvalued? It’s a question that everyone has an opinion on, yet has no definitive answer–is Ethereum overvalued? 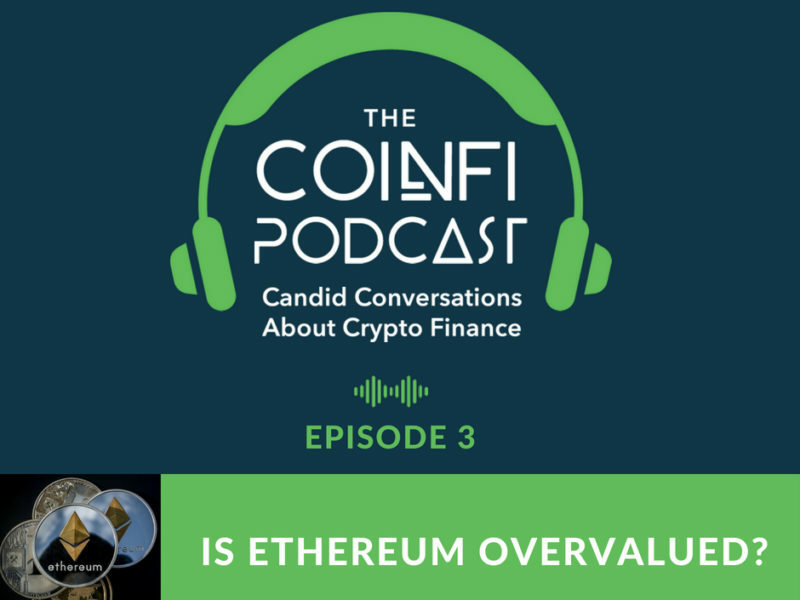 CoinFi’s Chief Data Scientist Alex Svanevik and co-founders Tim Tam and Han Chang dig into and attempt to answer this burning question in this episode of the CoinFi Podcast. Tim: As a trader, generally you can sell one third of the market volume without impacting the price, so 6.2 billion of Ethereum dumping should not move the Ethereum price at all, given that it trades two billion a day. I mean, over 10 days, people would just be able to sell it. Nate: Welcome to the CoinFi podcast. We have a lot of random conversations about crypto in the office, and we thought it would be interesting to just hit the record button and riff on whatever topics come to mind. The idea is that you get to be a fly on the CoinFi office, giving you an inside perspective on how the team members of a fast growing crypto start up look at this crazy new industry. The CoinFi team has an interesting mix of backgrounds, from co-founding a hedge fund, to launching a Bitcoin exchange in Shanghai, back in 2013, to heading algo development for major banks, to managing data science for online brands with hundreds of millions of pages a month. And on each episode, we're pulling different team members to talk about areas where they have professional expertise, or maybe even just a strong opinion. Han: What's up CoinFi fans? Welcome back to another episode of the CoinFi podcast. Thanks so much for joining us today. Today we're going to be attempting to answer a question that's basically impossible to answer. It's a question that everyone in crypto, not to mention the mainstream press, has an opinion on. We're asking and attempting to answer the question today, is Ethereum overvalued? Han: I'm your host Nate Tsang, and with us today are CoinFi co-founder, CEO and former hedge fund trader turned crypto trader, Tim Tam. With us also is CoinFi co-founder, CTO and ex-co-founder of defunct Chinese Bitcoin exchanges Bit Excess, Han Chang. And finally, with his first ever appearance on the CoinFi podcast, our very own Chief Data Scientist, Alex Svanevik. Say hi to the audience, Alex. Alex: Hello guys. What's up. Nate: I'm gonna kick this episode off by quoting Vitalik's tweet storm from December 2017. Back then, he said: "So total crypto coin market cap just hit .5 trillion today. But have we earned it? How many DApps have we created that have substantial usage? How much censorship resistant commerce for the common people have we enabled? How many unbanked people have we banked?" Nate: As of today's recording, in June 2018, Ethereum has a market cap of roughly 50 billion, and a price of roughly $500. Now there are obviously a lot of different ways to value Ethereum and crypto in general, but here Vitalic brings up a common criticism of crypto's market cap, which is that the market cap far outweighs the practical and economic value currently being generated by the blockchain. I just wanted to get each of your reaction to Vitalic's comments, and then more generally your answer to the initial question: Is Ethereum overvalued? Alex: So I think it's hard to disagree with Vitalik in general, right? I would probably say that he's probably spot-on in the sense that money generally moves faster than how fast people can build products. So I think that's very much the case with Ethereum. You spend a lot of money invested in this space, I don't think developers have had enough time yet to produce the products that they are thinking about producing, and I think the result of that, we've kind of seen in January where you saw a big spike in many of the crypto prices, and then it's cooled off in the last couple of months. So I think, at a high level, Vitalik is pretty much spot on in his assessment there. Tim: Yeah, it's interesting you mention that, Alex. I guess mostly with what Alex says, but in terms of the broader question I've always thought of when you mention that name is when you talk about value, what is the definition of value? Are we talking fundamental, or are we talking how, I think what a lot of people in the crypto markets are looking at, is is the price of Ethereum going to be higher or lower in a year's time, in a month's time, in a five year's time, or is it an academic argument? Just kind of an open ended question. Like how do we determine value? Is it just a measurement of the price, or is it a measure of fundamentally how we should be looking at what the price of Ethereum is? Han: I'm gonna go out on a limb and I say, regardless of the definition, Ethereum is undervalued in my strong opinion at the moment. I mean, obviously, the recent SEC decision to have Ethereum not be classified as a security has helped the price a bit, but even then, Vitalik's statement in 2017 saying, hey guys, we really should be building more, I definitely agree with. There needs to be additional technological progress, but in terms of what Ethereum is capable of today, and the maturity level that it's at, as well as kind of the roadmap that is in place, that they're still working towards, I think that actually unlocks a ton of value. Han: So just for example, just the fact that we're able to tokenize anything, assets, basically anything, is already kind of the killer feature. Everyone's saying, oh, there is no killer DApp. CryptoKitties is the best that we've got, and I would really beg to differ, because, obviously as CoinFi, we raised money through an ICO to fund our platform, and that is a pretty killer feature in my book. Tim: Yeah, so Han, I think we've kind of had internal debates about this. Look I agree with you that Ethereum is valuable, but again, putting my finance hat on, what number do you associate with that? There clearly is value in the ability to raise money by an ICO on the Ethereum blockchain, but is that value 50 billion? Is it 500 billion? Is it 5 trillion? I mean, how do we quantitatively look at that? I think, with respect from an engineer's point of view, I think it is definitely valuable, but how do you prescribe an actual value to it? Because in finance, we traditionally, there are very concrete measures to measure this. Like people use like a discounted cash-flow model, or a price-earnings model. There's some association with revenue and profit, right? So how do you come up with a number on how to value Ethereum? Alex: Yeah. I agree with that in the sense that I think you can take kind of an academic approach, look at the fundamentals. The other thing you can look at is just the change over time. Which is probably what most people do when they think about the price of Ethereum. Is something going to happen in a couple of months that will increase the demand for Ethereum? Perhaps, we can say that there's a third way to try and come up with an assessment of the price of Ethereum and that's relative to other crypto projects, relative to other block-chains for instance. We have EOS that came out quite recently. It's valued, I think, a fifth of the price of Ethereum. Is that a fair assessment? Alex: Of course we run into issues, because then how do you value EOS, right? But you can look at the relative differences as well. I think that's another angle you can take, to compare it to other block-chains. Han: No, great point guys. So I guess part of my argument is that, because of all of these different blockchain projects who are raising money in Ethereum, they need operational capital to actually run their businesses, and build the products that they promised their supporters, and so as a result, they need to sell off their Ethereum to fund their operations. And as a result, I feel like a lot of the price changes in Ethereum has been partially been because of all of these projects needing to sell-off their Ethereum back into fiat to handle operational expenses. That's kind of artificially keeping Ethereum prices down. Tim: So I think that's a fair point, Han, and high level I agree with you. That's a logical argument. But when I actually dig and look at the numbers, I think ICOs raised last year on EOC 20 raises, is like 5.6 billion in 2017, if I remember correctly. And the first quarter, 2018, it's 6.3 billion. But the reality is, if everyone in the ICO market this year dumped and converted their Ethereum into US dollars, which obviously is not true, but let's take that argument if it is. That's only 6.2 billion US notional worth of Ethereum to sell. Tim: Ethereum trades 2 billion a day across all markets, and I'm not sure if this is the right way to look at it, but as a trader, generally you can sell one third of the market volume without impacting the price. So 6.2 billion of Ethereum dumping should not move the Ethereum price at all, given that it trades two billion a day. I mean, over 10 days, people would just be able to sell it. Tim: So for me I'm always interested in looking at the quantitative side rather than just the high level argument. Now I think, whether a lot of that Ethereum volume is real, and arguably you can sell on some exchanges that are maybe more impactful, but the high level numbers seem to me that even if everyone sells Ethereum, and they're doing it in a not-panicking fashion, then it should not dent the price. Alex: Maybe we can move into the fundamentals of Ethereum, right? When people try to assess the value of Ethereum, one approach to take is to look at ... One approach they take is to look at the equation of exchange. So, essentially, this is the equation you might've seen: mv = pq, monetary base times the velocity is equal to the price of a good times the quantity of the goods. It sounds a bit technical, but another way you can think about that is essentially, you can reshuffle the equation and you can say, actually the monetary base, so the total market cap of Ethereum is equal to the total Ethereum economy, if you think of it as a country or an industry or something like that, divided by the velocity. Alex: So if we think about those two factors, like how big can the Ethereum economy potentially become, if we assume that the market is following this kind of logic -- I'm not saying they do, but we can assume that they do -- then the velocity, let's say it's at 10, for instance. This is similar to a US dollar roughly. That means that the total economy that the market price is orienteering economy is roughly 500 billion US dollars. If you're thinking of the market caps, maybe 50 billion. Alex: So is that realistic if we assume that velocity is correct. Half a trillion dollars economy for Ethereum. Tim: And the economy is defined, so it's 10 multiplied by 50, that's where we get the 500, but that 500 is like expenditure or ... ? Alex: So the insurance market, for instance, is many trillion dollars worldwide. So that's the large chunk of money that Ethereum can eat into, and where you can use smart contracts, for instance, to serve some of that market instead of the insurance companies. That's all I'm doing here. So 500 billion to me sounds like, actually, assuming that velocity could be a lot bigger than that, when you think about all the new industries, the new businesses that Ethereum could enable. Alex: So I think I agree with Han in the sense that I think Ethereum could be huge. But I also think there is a risk factor here, that perhaps, we're not ... Maybe a lot of the market is not considering that much. There's a probably Ethereum just fails as real world project, that it's overtaken by a competitor, many of these other risk factors. I think it has huge potential, but there's also many risk factors that can make it fail. Han: Actually, no that's a great point Alex. I think there are substantial risk factors. In terms of another project kind of overtaking it, I'm very much on top of that, at least on the technology side, where any contender to the smart contract throne, I will be evaluating quite closely for a variety of reasons. But at the moment, there's nothing really on the horizon yet, and just the amount of developer community/developer resources available for Ethereum, to me at least, make it fairly confident that that is not going to be a failure point. But I definitely agree that that possibility absolutely exists, and anyone who has financial interests or otherwise, and Ethereum does need to pay attention to that. Han: But on the other point, where there's other points of failure, I think the one that I am most concerned about is the proposal to switch from proof of work to proof of stake, aka like the Casper protocol or whatever. And so, if that transition goes poorly, that could definitely have a very negative impact on Ethereum price, and that's kind of the big tipping point, where in my book, this is absolutely a risk factor. Tim: And then, Han, when you say that there's no obvious incumbent that can potentially takeover Ethereum, do you look at it and ... Sorry, this is probably my way of looking at it. Do you look at Ethereum where over time, as there's more ICOs launching on it, there's more people using the blockchain, it becomes a defensible mode, almost like how it's almost impossible for a social network to overtake Facebook. Is that a good analogy? Han: It's a similar analogy. I guess, obviously, the track record that Ethereum has with regards to smart contracts is unparalleled at the moment. But the other thing is really just developer mindshare. So in order for you to actually build on the Ethereum or other blockchain, it requires a bare minimum of developer tools. And the tool chain for Ethereum is the most mature out of everything else. And that being said, by the most mature, I mean it's still got a long ways to go. I mean, stuff is broken, to be perfectly honest, right? But that just means that everyone else is even further behind, which means that those communities are actually not able to ship anything fairly reasonable. Literally the only thing that I'm aware of that's remotely close is NEO, and NEO has its own interesting problems that we can discuss later. But that's where I have the confidence where, if you can't even build on top of the blockchain that you want to compete against Ethereum, in my perspective, that's probably not even a threat at the moment, right? Tim: So would it mean that one good thing to look at for a non-technical person to potentially spot someone being a legitimate competitor to Ethereum is that you start spotting like tool chains are being developed very rapidly for that block-chain. So I'm throwing it out there, could someone else fork Ethereum and have a tokenized incentive system to incentivize developers to improve the tool-chain. Han: I would say a fork absolutely not, because any sort of fork would require substantial community buy in why that fork is superior, otherwise there's no reason to switch. So yeah, forks I'm absolutely not concerned about. But yes, I would say that any other project, aka, maybe like a Cardano or Stellar who has the capability to really deliver on much developer experience, then that is absolutely a threat to Ethereum long term. Alex: I think this actually kind of brings us back to Vitalik's point, right? Which is essentially that we need to build, and there's a lead time in building. So for these other potential contenders to go up and challenge Ethereum, you're probably looking at months, if not years, of lead time before these projects can actually ship DApps and all these other things that you want to be built on top of their blockchain. Han: Yep. And one other thing that I thought of recently is, a lot of Bitcoin price action back in the day was a result of say, Bitcoin futures being released and all that kind of stuff. That hasn't happened for Ethereum yet. These additional financial products that allow for more liquidity, allow for more hedging to induce the institutional players to come in, and so that's where a lot of my bullishness comes in as well, where when there is a Ethereum futures market that I feel like that should only improve the price, basically. Alex: Right. I just want to go back to one point that you mentioned, Han, about proof-of-stake. Because I agree with you that's a risk factor, but it's also, there's a reason why they're doing it, why it has some very potential benefits for the technology. And actually, when you look at the equation of exchange again, staking could potentially lower the velocity, because you have more of the supply that's being staked. Alex: And therefore being taken out of circulation. So that's something that could actually increase the value, just from the fact that you're reducing the velocity. Han: Absolutely, yeah. And so if proof of stake is actually executed well, and that transition goes very smoothly, absolutely, I think price of Ethereum as a result will also increase. Not only do you get the reduced supply because of people staking, but also just in terms of the transaction volume that's possible in terms of the transaction confirmation times being reduced dramatically as a result, all of those should only improve the Ethereum experience. Alex: So I think one big downside for me, at least when I want to think about the valuation of Ethereum, at least in the short term, is that there are actually very few people using Ethereum. And when you think about the DApps that are built on top of Ethereum, if you just look at the statistics, the most popular DApps have perhaps a few thousand daily active users. If we assume that wallets are more or less the same as users. CryptoKitties was very popular, now it has only a couple of hundred users daily. So for me this is one area where I feel like I buy into the long term vision of Ethereum, but right now I think there's a strong argument you could make that it's overvalued right now, when you think about the actual usage of the blockchain. Han: I actually have a counter argument to that. I find it interesting that everyone focuses on DApps as the killer feature, killer app or whatever of Ethereum, but I actually truly do think that it's the ability to tokenize existing assets, or issue some sort of value to people that wasn't available before. That already is a killer feature in my book, and so I kind of think that, as a result, it justifies it obviously, or Tim has a great point where I'm able to put a number on that, but I do feel like the emphasis on DApps is maybe a little unwarranted. Han: But that being said, with the advent of proof of stake, perhaps by reducing the transaction confirmation times, DApps will be more plausible in the future. Tim: So Han, I guess you know for me, Bitcoin is very simple to understand, or easier to understand more when I transfer one Bitcoin from my wallet to another, there is a deduction in Bitcoin price. There's a transaction fee charged in Bitcoin, right? Han: Yes. There's a, yes, there is a deduction of Bitcoin that's part of the transaction fee that you pay to the miners for the privilege of recording your transaction on the blockchain. Tim: Sure. So let's say, I mean Bitcoin is obviously way too solvent, but let's say it really took off, everyone uses Bitcoin to transfer, there's gonna be a certain amount of Bitcoin that's going to get ... Let's say the Bitcoin transaction fee is not 1% for the simple math, keep it as 10%, so if I needed to transfer $100 in Bitcoin, then I will need $101. So there's effectively, if I was doing a lot of transfers a day, that company doing a lot of transfers needs to buy a bunch of Bitcoin in advance and not use it. Similar to how BNB right now, the fact that people are holding it for commissions, there's a natural demand for that, because people know they're actually going to be spending it. Tim: So I'm trying to quantify in Ethereum's case if you're doing say, 10,000 transfers a day, how much Ethereum do I actually need to pay for those transfer fees. Han: I think there are confounding factors to the answer of your question where it doesn't make sense to do the analysis in the way that you're proposing. And this is why: number one, the transaction confirmation time can differ. So you can choose to pay less, and have your confirmation take much longer. So you can theoretically pay very little, but your transaction can just take a long time to confirm. So it really depends on what you prefer in terms of the confirmation time, as part of the function of cost shown. So as a result then, it may not be an accurate representation of the amount of usage that's being gained in the blockchain if that makes any sense. Han: And then the other part is, it really depends on how many miners there are as well. So the more miners there are, the less you have to pay for a faster confirmation. So with those two variables in play, it's hard to get that valuation that you're hoping for from that metric that you're proposing. Tim: But is it also correct that I understand there's confluence of factors which drive the cost, because the transfer cost is a dynamic variable. However, is it accurate to assume that if transactions really take off, people are gonna need to hold ... Like for instance, right now, people need to hold a small amount of Ethereum whether they like it or not if they're transferring ERC20 tokens. I know anecdotally, it's a very small amount, but I'm trying to think, like I understand we can't pinpoint exactly what that amount is, but can we do a high level analysis where, if Ethereum transactions, because people fundamentally to me, people need to pre-buy Ethereum in order to facilitate transfers on the Ethereum blockchain. Alex: I think, I mean what you're talking about here is the supply and demand science. And I think with Ethereum you can think of two services or goods. One is Ether in itself, right? The demand for that, for instance, if you're investing in ICOs that increases the demand for Ether in general. The other is the supply and demand of just executing smart contracts in general. And if, let's say, you have a lot of these DApps, or you have other services that are built on top of the Ethereum blockchain, it's natural to assume that that will increase the demand for executing smart contracts. Right? And in order to serve that, yeah, you're going to have to stock up on Ether to pay for smart contract executions, because that's how you pay for it. So there is a very natural, I think, connect to the supply and demand sides. Alex: And that, just a side note here, because many people talk negatively about Bitcoin and the costs of transferring something on the Bitcoin blockchain, but actually when you think about it, that's kind of a success metric as well. Because it means that it's actually serving ... People are willing to pay for that service, and it's really filled up its capacity. Bitcoin is a failure because it's so expensive to actually do transactions on it, but you can look at it as, from the totally opposite view, I think, and say that this actually shows that there's a lot of demand for this kind of service out there. And I think it's similar in the Ethereum case. Ethereum from a technical perspective is a bit different because it has variable block sizes, not exactly in the same way as Bitcoin. But of course, the more demand there is for smart contract executions, the more demand there will be for Ether. Han: No, that's an excellent point, Tim. So actually, yes. You're right in that there is a metric that we can measure to see what the increase in usage is, and that's really the amount of GAS that's spent. But in terms of how the GAS gets mapped onto the Ethereum price for each operation that the GAS represents, that's the part that I'm not entirely sure is an accurate representation. But yeah, if we look at just GAS usage in general, that gives us at least a trend of, yeah, the usage of the Ethereum blockchain in general, if that makes any sense. Tim: And Alex, I think you raised an interesting point when you mentioned people complain about transaction fees on Bitcoin. But I have a slightly different view on that where, I think view and vision of Bitcoin originally was it to be a replacement kind where you could transact forward to buy coffee or something like that. So the cost does become prohibitive on that aspect. So I take the point that if people are willing to pay the fee, it means there's demand for that. However, the demand I would say, largely in last year's market is driven by speculation, not usage. So I look at it slightly differently as, yes, people are willing to pay that price per transfer, but as they have the view that Bitcoin's gonna go up, not willing to pay. But it's different, if someone was willing to pay that transfer fee to buy a cup of coffee, then it's different, because that really shows that people want the convenience, and pay that fee for the convenience to get that cup of coffee, versus I'm paying a dollar fee because I think Bitcoin's gonna double in price. Alex: Yeah, yeah, that is a difference. And I think this boils down to, what is the purpose of Bitcoin? What is the purpose of these blockchains. You can have many different views on that. We don't have to enter the Bitcoin versus Bitcoin cash, and all that stuff. Tim: That's another podcast, right? Alex: That's another podcast. But I think you can think of blockchains as open marketplaces, and the participants in these marketplaces decide what gets executed on them. And so maybe, from a marketplace perspective, buying a cup of coffee doesn't really make sense when you have such limited supply of transactions that can be made. Nate: Yeah. Maybe this is a good spot to wrap up. Been a very interesting conversation. We have a lot of different views from different backgrounds. Maybe all of you can go through and just summarize your view in a few sentences. Do you think Ethereum is overvalued or undervalued, and why? Han: Buy now, buy now, buy now. Alex: It's undervalued guys, pick it up. Tim: I think I always defer to Han for technical opinions, always defer to Alex on the data side and the analysis side. I mean, for me, I strongly think that from a profit point of view of whether Ethereum prices are gonna be higher in a year, I say with high confidence that it is. Because, I mean, just from a trading point of view, it's trading at the low end of the range. They're still at the start of a multi-year, all cycle. Ethereum's the second largest market cap coin. Institutional investors who come in are only gonna buy Bitcoin and Ethereum. In size everything else will double in, so all those factors to me, indicate that Ethereum is a good ... I hesitate to say undervalued or overvalued, because value is a very subjective thing. I think the price is low, and it will be higher. I think that's a better way I would put it. Alex: I probably say that I think Ethereum might be slightly overvalued in the short term, because of the usage metrics, but I do think that it's undervalued in the long term. Nate: Great. Thanks for the awesome discussion guys. We'll see you guys next time. Nate: Thanks for listening everyone. We hope you got something out of this conversation looking at the valuation of Ethereum from the point of view of a hedge fund trader, a technologist, and a data scientist. Thanks to Tim, Han and Alex for taking time out of their busy day to share their thoughts. And we'll catch you guys next time on the CoinFi podcast. Nate: Thanks for listening to the CoinFi podcast. If you enjoyed this discussion and want to hear more, we'd really appreciate it if you took a moment to leave us a review on iTunes. That helps others find us, and let's us continue to record more episodes for you guys. If you don't think the podcast is worth a five star review, we'd love to know why so we can improve for next time. Please hop on over CoinFi.com and leave us a comment. We love to hear how we can do better next time. Nate: If you're still listening at this point, you might be wondering what exactly CoinFi is. CoinFi is a market intelligence platform for crypto investors, powered by the CoinFi token, which is available for trading on Kucoin.com and Gate.io. Find out more about the CoinFi platform and the COFI token, go to CoinFi.com/about. Also, keep an eye out for the launch of CoinFi News. CoinFi News give crypto investors like you an informational advantage. Be the first to know the news that moves the markets, including when a token gets listed on a new exchange. To get early access to CoinFi News, go to CoinFi.com/news-beta to sign up as an exclusive beta tester when the product launches later this summer. We're only accepting 500 beta users, so sign up now to reserve your spot. Nate: That's all for this episode. See you next time.